The Advanced version of the Cycling Service is called Web 2.0 Wheeling Service. This Wheeling Service is one of the best Services provided. This service has very high power to boost your Search Engine ranking and position. By viewing the charts below, you can see the dynamics of this service and how many elements are at work in order to boost your primary website with huge number of blog sites as well as with top social networking sites. Web 2.0 Wheeling service, which is very similar to the Web 2.0 Cycling service but has some more advantages. Simply put, this is the Advanced version of the Cycling Service. The main task of this Wheeling method is to build links with numerous top ranking sites and with numerous social networking sites We are going to inter-link all of these websites with your primary website, so that your primary website will reach numerous people very quickly and get more traffic. 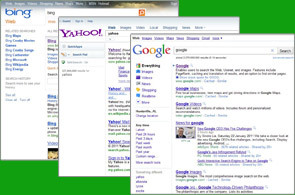 As everyone knows, or becoming more aware, that Social bookmarking sites like Digg, Stumbleupon, etc play a significant role in SEO (Search Engine Optimization), and this is very useful to get more traffic. By getting more traffic to your primary website, you have more opportunity to convert more business and ultimately increase your bottom line. We will link your primary website to 4 top blog sites, each blog site has links to your primary website. And then each blog site (Main Wheel) will have 4 more blog sites linked to them, thus 16 different blog sites has one link to the Main Wheel and also another link to your primary website - which means your primary website has the links from those top blog sites that we created and that each blog sites has the links of yours primary website, thus the name WHEELING. So your primary website can and will get more and more links which is very useful to earn more traffic to your website, as well as increase your search engine results. 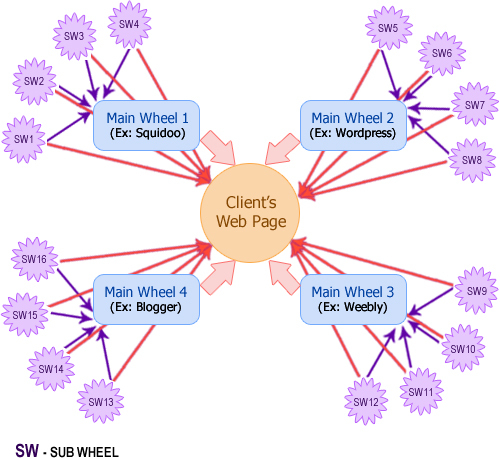 This picture contains your primary website, 4 main wheels (4 top blog sites) and each main wheel contains 4 sub wheels, thus totaling 4 main wheel has 4*4=16 sub wheels, these 16 sub wheels are going to have a link to the main wheel as well as your primary website. The sub wheel is also top blog sites, so that your primary website is going to be boosted with 20 top ranking blog sites. This Web 2.0 Wheeling with Promotion package is same as Web 2.0 Sub Wheeling, but this service has even more advantages. We will link your primary website to 4 top blog sites, each blog site has links to your primary website. And then each blog site (Main Wheel) will have 4 more blog sites linked to them, thus 16 different blog sites has one link to the Main Wheel and also another link to your primary website - which means your primary website has the links from those top blog sites that we created and that each blog sites has the links of yours primary website, thus the name WHEELING. And then on top of this, EACH blog site is promoted within 10 different top social bookmarking websites too. Each of these will link to your primary website also. 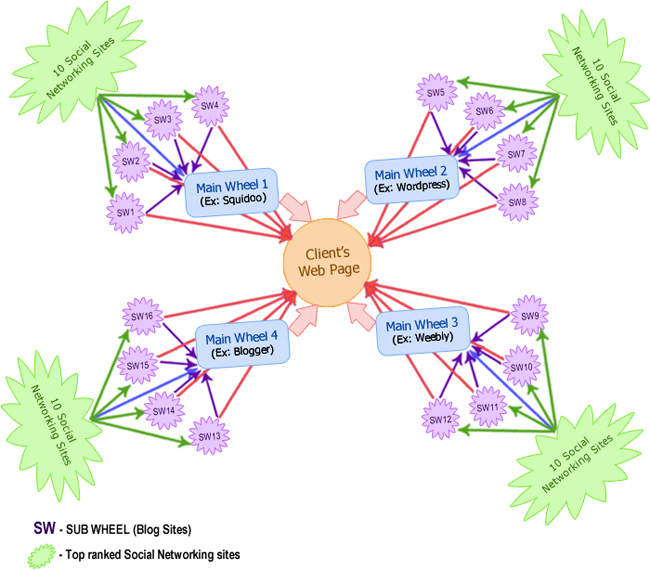 This picture contains your primary website, 4 main wheels (4 top blog sites) and each main wheel contains 4 sub wheels, thus totaling 4 main wheel has 4*4=16 sub wheels, these 16 sub wheels are going to have a link to the main wheel as well as your primary website. The sub wheel is also top blog sites, and each sub wheel is again promoted with a number of top social networking sites, thus you can get even more visibility. So, your primary website is going to be boosted with 20 top ranking blog sitesand 160 top ranking social networking sites.